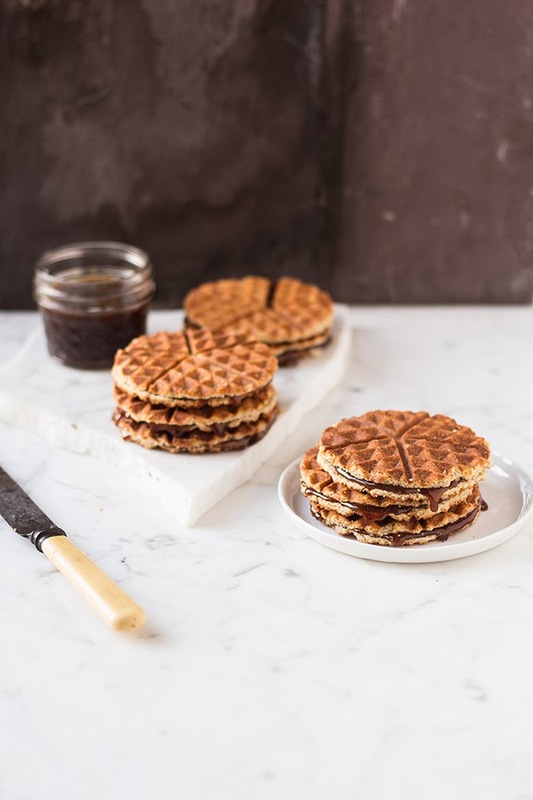 I made stroopwafels without a pizzelle! That’s a fancy iron made specifically for one use, aka this. That’s also a lot of money and space spent on an appliance that might only get a handful of uses. London Bakes did a far better job of justifying why its good to only have just a few kitchen gadgets when she made buckwheat waffles with roasted rhubarb (made your mouth water, didn’t it?). The original name of these sticky Dutch crispy pancake sandwiches has wafel in it. Wa-fel. But let's just pretend it says 'waffle' okay? 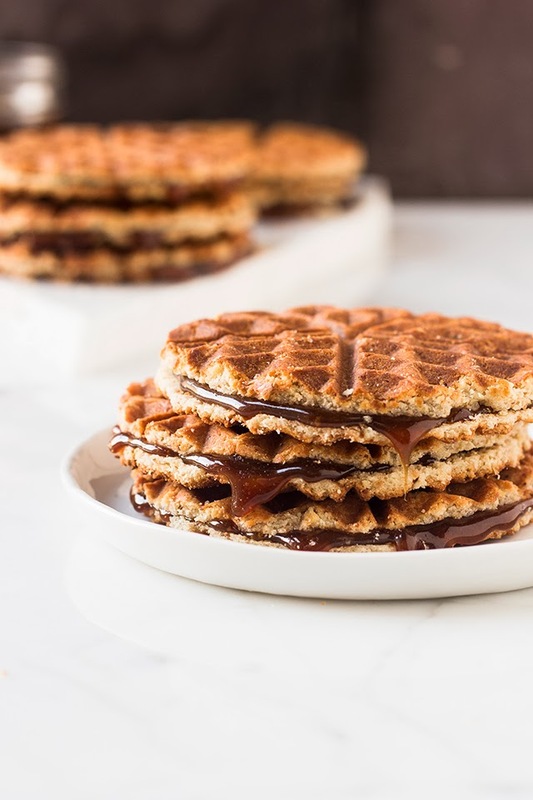 So if the name has a waffle in it, then why are all the recipes telling me I need a pizzelle to make the crispy wafers holding the caramel (they say its caramel but I’m convinced its toffee) in place? That’s when I realized there was a waffle iron sitting on top of the dryer that would definitely benefit from having the dust blown from it. Sure, they look like waffle sandwiches. But the taste has chewy dutch goodness written all over it. At this point you still might not have a frickin clue what stroopwafels are…for that I am sorry. These pleasingly large disks are usually found packaged in two beside the tills in coffee shops. My friend used to say that Starbucks stroopwafels smelt like wet dog, she still ate them though. Maybe she enjoyed wet dog. Luckily, these are NOTHING like wet dog. I should know, I made them at 1am with 2 sloppy sharp pei’s by my side, rooting me on like the supportive fluff balls they are.They're quite large in size because they're meant to sit on top of your cup of coffee and heat up, making them a right warm treat by the time you eat it. And the waffle iron experiment worked a charm! At first I was like…Oh THAT’S why I need a pizzelle, these things aren’t cooking in the middle! But after you let them firm up overnight, you get a crunchy ice cream cone type texture and a deep dark toffee flavour from the filling. Yeah its sticky, but it sure as hell don’t taste like wet dog. Note: This recipe only works with a shallow waffle iron, so something like this instead of this. 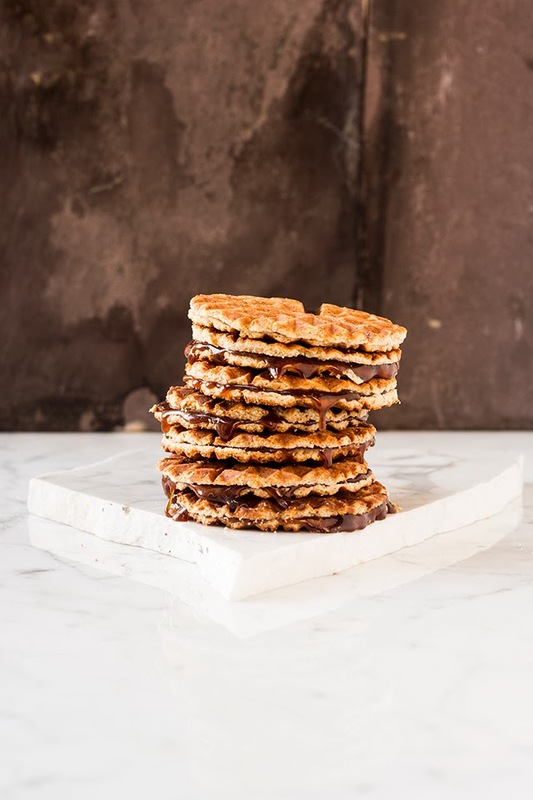 Equally, the recipe works just as well with a pizzelle...but lets not get into that. Add the melted butter and yeast to large a bowl (or a freestanding mixer fitted with a dough hook) and leave to stand for 1 minute. Add the milk, egg, sugar and flour and stir to combine. Knead the dough for 2 minutes on a floured surface (or 1 minute in a freestanding mixer). Cover the bowl with a tea towel and leave to rest for 1 hour 30 minutes. To make the caramel, place the sugar and golden syrup in a heavy bottomed saucepan on medium heat. Once the sugar has dissolved, let the mixture bubble for 1 minute then take off the heat and stir through the cinnamon and butter. Preheat the waffle iron on its highest setting. Use your hands to form 5cm round balls of dough. Place a ball in the centre of the iron and cook for 1-2 minutes until golden brown. As soon as you remove the cookie from the iron, take a small sharp knife and run it through the centre (horizontally) to make 2 thin sandwich halves. 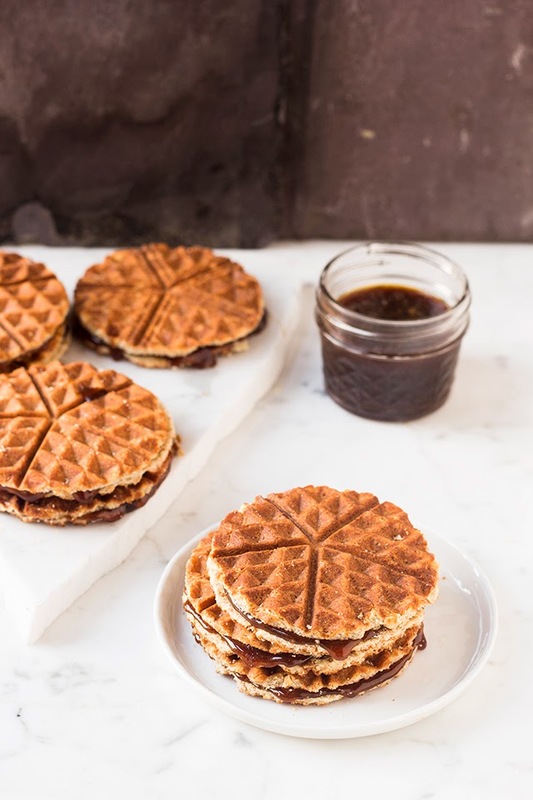 Don't be alarmed, this is really easy to do when the wafels are still warm. Spread a thin layer of caramel on the bottom half and place the second half on top. Repeat with the rest of the dough. Lasts for 1 week if stored airtight. I love these - and I have a waffle iron lurking somewhere. I am that weirdo that doesn't own (or even realize she needs) a waffle iron, but totally takes up valuable pantry space with a pizzelle iron. Priorities, no? It's about time to dust the old thing off, and this recipe gives me an awesome excuse to do just that! These look like HEAVEN. I love stroopwaffles. These are SO CLEVER. 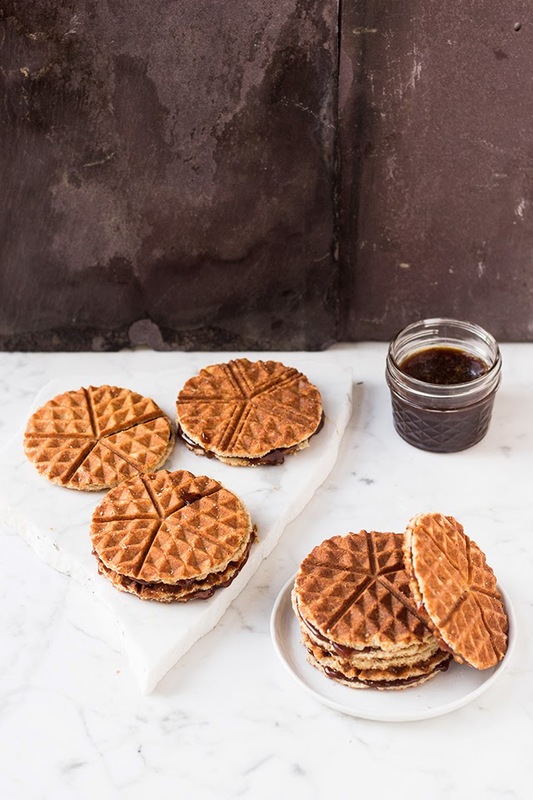 I can't believe you made them in a waffle iron; total genius. PS thanks for the waffle shout-out! No problem, your waffles (and pictures) are beautiful! I'm going to take a leaf out of your book and start baking with natural sugars. I dont think I can handle anymore saturated fats! Emiiine I'm so obsessed with these. (Even though I don't have a waffle iron OR a pizzelle iron. I'm so taking up space with this useless comment.) 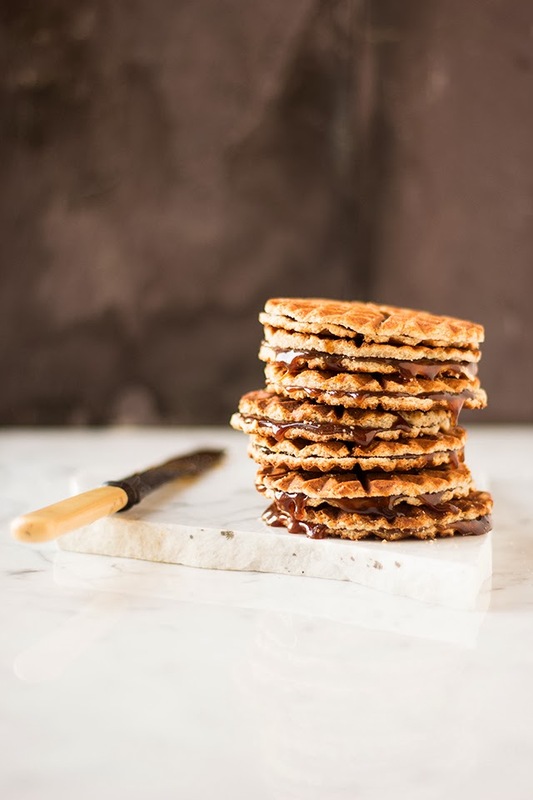 I love stroopwafels, and looove that you made them at home. If I ever get my hands on either iron it's onnn. Do you have a cheese toastie maker? You can totally make them in one of those!! I was obsessed too, now i think 've had one tooooooo many! These are amazing. I want a waffle iron and/or a pizzelle iron! That caramel looks lovely too! I live in the Netherlands and these are one of the most traditional sweets that the Dutch have. I love them but never thought of making them. The ones being sold ehre as so incredibly good there's no need. I'm tempted now though :) Love your photos! A friend of mine was just visiting from the Netherlands and brought me a gift of Stroopwafels. I've never had them before. Since Pizelles are my FAVE cookie in the world, I knew at one glance that I would love these cookies! My weekend mission: I have a pizelle iron and I'm not afraid to use it!